Well, it’s time to make headlines that are not only good for your newsletter but are also good for your health! Indeed, we had lots of delicious fun with the headline below and all we had to do is to take a trip to the salad bar. We combined various fruits and vegetables and created a headline or a masthead that really speaks to the topic. By using fruit and veggies, we not only grabbed your attention but we instantly conveyed to readers that this is a publication about healthy eating. We looked for shapes and colors that help define letters in the headline. Finding sahpes that work can involve some experimentation. 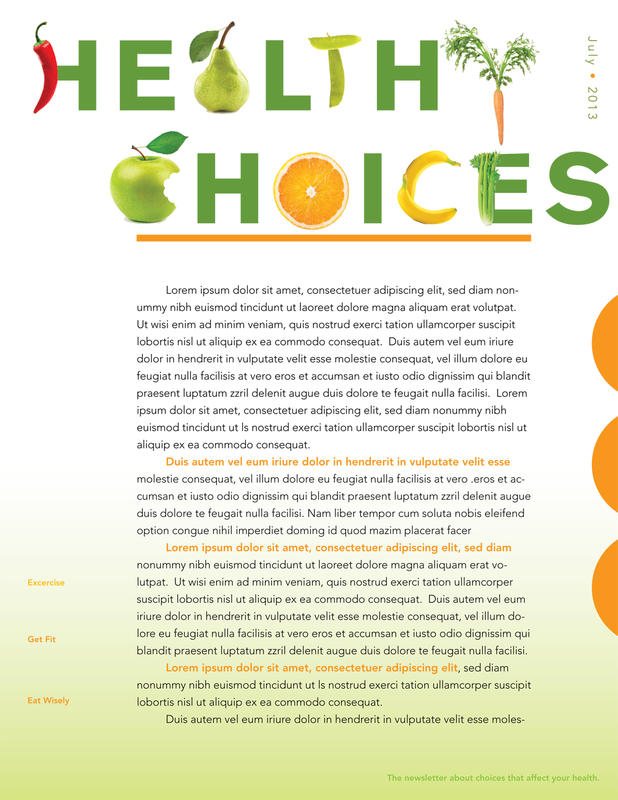 Achieving the right mix will result in a successful design for your newsletter, magazine or e-publication. These headlines and masthead treatments are great for newsletters on gardening, fitness, health, grocery shopping, dining, healthy eating, cooking, active lifestyles, foodies and agriculture. To find out more about how we can help create an effective type treatment or masthead for a newsletter or e-publication for your firm or organization, contact HWDS at hwdesign@west.net. Go ahead and grow healthy headlines! These will help sprout new successful corporate communications. This entry was posted in E-publications, Healthcare Marketing, Newsletters by Successful Corporate Communications. Bookmark the permalink. Such beautiful work Harlan! What a talent!